I started using fountain pens when I was in my early teens, but I really went crazy over them when I was in my early 20s. I thought it would be fun to write some quotes and hear what you think as well! I really enjoy this Faceted Capless model by Pilot, and wish they were still made today (in a variety of colors, especially). 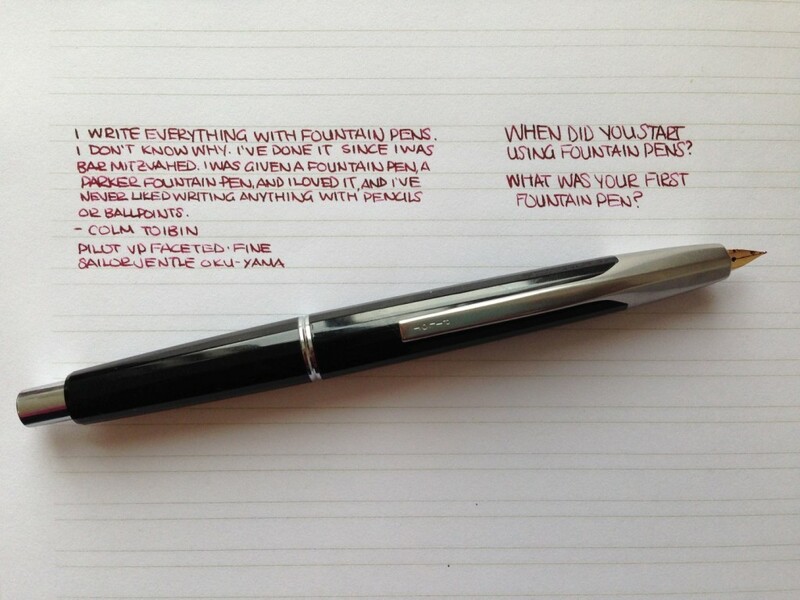 The fine nib is precise and crisp, and a pleasure to use. It’s also fun to see how small I can write. My first fountain pen was my dad’s Sheaffer Prelude, which I eventually returned to him so I could get him back into using fountain pens. This entry was posted in Vintage Pens and tagged Handwritten, Handwritten Post, Pilot. Bookmark the permalink. Follow any comments here with the RSS feed for this post. Post a comment or leave a trackback: Trackback URL. It’s nice that he writes everything down with a fountain pen. It would be even nicer if he wrote in cursive instead of block printing. That’s what fountain pens are for.